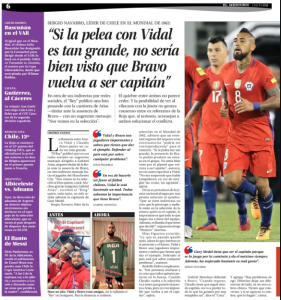 It doesn’t matter the time of the year, there will be always a reason for the Chilean press to write about the fight between Claudio Bravo and Arturo Vidal once again. The subject today is a picture posted by Vidal on social media. He’s received a picture from Chilean goalkeeper Gabriel Arias, and besides thanking him, the Barcelona midfielder said he’s looking forward to meeting him at the national team again. Bravo hasn’t been playing for Chile out of his own choice, and the local media took Vidal’s post as a message saying he doesn’t miss the Manchester City goalkeeper in the squad. So newspaper El Mercurio invited several ex-players to comment on the subject. Since Claudio Bravo is the captain of the national team, the way he’s received by the teammates is obviously a big deal for the local media. “When he returns, Claudio has to remain a captain, he will not lose everything he has won by such stupidity”, said Gabriel Mendoza. “There are ego problems, they should leave their differences aside, they are no longer kids, they have to talk”. Sergio Navarro disagrees: “If the fight was so big, Bravo’s presence could cause a delay in the group. It would not be well seen by the squad to be captain again”. So when Bravo decides to return to the Chilean team, we can already expect some big noise from the local media. It will be a big deal if he really loses the armbrand.